Looking for a highly portable keyboard that offers plenty of control? Look no further. As portable as you'd hope - you can take this anywhere! Doesn't feel like a toy. iOS and Linux compatibility for maximum versatility. Requires a Camera Connection Kit for iOS use. The Launchkey Mini is Novation's entry in the mini keyboard stakes, and lines up against Korg's Microkey and Akai's MPK Mini. It's the baby of Novation's Launchkey range, with 25 keys, 16 velocity-sensitive pads (with three-colour RGB backlights), eight assignable knobs and seven function buttons. This is a healthy amount of input for such a small device. Most importantly, the Launchkey's base is bright orange, a 'feature' it shares with the other Minis. And why not? Tiny keyboards like this are only one step up from using the virtual equivalents you get in Live and Logic, but they are playable, and you do get velocity sensitivity. The package also includes a USB cable, free downloads of Ableton Live Lite and the V-Station and Bass Station soft synths, and a Loopmasters sample pack. The keys on the Launchkey are small, true, but given that it also hosts pads, buttons, and knobs, that's a fair compromise. It's about overall control of the software, rather than getting a piano-style experience. 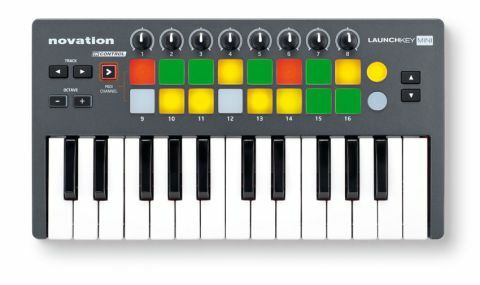 Novation has made set-up as straightforward as possible, whether you're using the Mini with its free Launchkey iOS apps, or with Ableton Live, Logic Pro, FL Studio or any other DAW on your computer. There are no drivers to install, and there are starter templates for Live, FL Studio, and Reason to download. Up to a point, instant control is available, and beyond that you can create your own custom MIDI assignments and save them in the user presets on the Launchkey. We began testing in Live on Mac OS X. After configuration in Live's Preferences, we had some immediate control over Live. The Launchkey handles basics such as track mute/solo, scenes, and macros. The Launchkey behaves like a regular controller in a small package (minus pitch, mod, or aftertouch), and with specific functionality for Logic Pro, Cubase, Pro Tools, Reason, and FL Studio. To connect to an iPad, you need Apple's Camera Connection Kit. The free companion Launchkey app hosts synth sounds and effects and has a touch interface, and the Launchkey does the rest, creating a very usable self- contained instrument. Of course, the Launchkey also functions with other MIDI apps, but using it with the Novation app is a no-brainer. For laptop or iOS musicians, the Launchkey Mini adds that all-important tactile control vibe, and it's particularly cool when used with Novation's iOS app. Nobody will fetishise over this thing, but it's a very handy little object.